California Custom Coatings offers the highest quality concrete coating systems in Sacramento and Northern California. After many years of experience and field-testing, we selected the best manufacturers and coatings available. While other installers may offer you cheaper materials, we know that quality determines the durability and appearance of the final product. As a result, you can trust whatever we recommend and apply to your concrete floors. Due to past excellent results, all of our epoxy systems come with a lifetime adhesion warranty. When we put a floor down, we guarantee that it will not delaminate! This is our “no-peel promise.” We can offer this amazing warranty because of the superiority of our materials, employees and process. 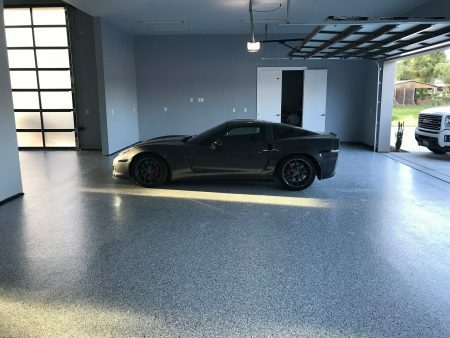 California Custom Coatings starts an installation with an aggressive diamond grind that both cleans and prepares the concrete for application of the epoxy. Out of concern for the cleanliness and air quality on your property, we use a powerful industrial vacuum with HEPA filtration to eliminate concrete dust. Both our grinders and vacuums are industry-leading models to guarantee effective results. Next we apply a wicking epoxy that finds the pores and irregularities in your concrete to thoroughly attach itself to the floor. Once it dries, this epoxy is mated to your concrete for life! After the epoxy application comes the color coat. This is when your preselected choices in color, texture and pattern are applied. Finally, a clear topcoat covers everything to seal it and provide protection from fading and scratching. By adjusting the depth of materials, the chemical composition and the texture, we install epoxy floors suitable for residential, commercial and industrial use.